On this episode of Millionaire Matchmaker we are going to see Patti set up Courtney Kerr from Courtney Loves Dallas (and previously Most Eligible Dallas). The episode starts off with Patti immediately “needing to address” something with her assistants. So far this season, the storyline outside of the match up has focused on the development of her new staff. Patti basically treats them like idiots while they smile and nod and are just happy to be on a hit Bravo show so they’ll do whatever she says as to not be fired. The issue she has this time is that her assistant, Justin, has taken a number from a girl who was at a mixer. Patti says this is her number one rule is that no staff will give numbers or take numbers. Patti tells him he’s on probation and he has one more strike or he’s fired. Frankly, I’m tired of seeing this part of the show and of Patti. She’s the boss, WE GET IT ALREADY! Part of what made the show fun before was her relationship with Destin and Rachel seemed to be more of a partnership not this hierarchy that just has Patti screaming like a lunatic to her employees all the time. They’re not children, they are grown adults and do not need to be ber ated. Patti gives the introduction of Courtney Kerr, explains that she’s a 10 but she’s hard to please. The role the tape of Courtney in Most Eligible Dallas running through her checklist of what a man needs to be: “tall, plays golf, can hang out on the ranch or go to a fashion show, etc…” Patti asks the assistants who they have. 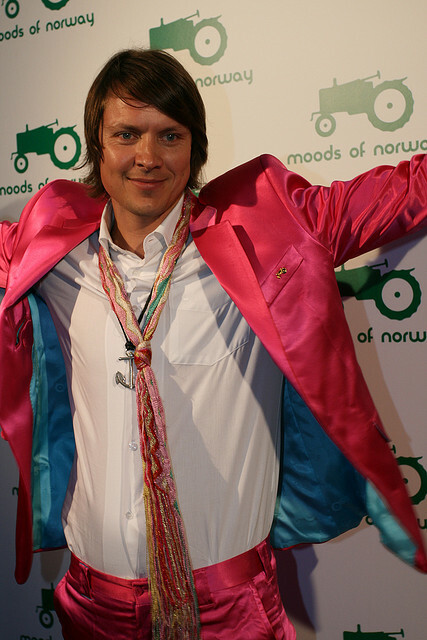 David has Stefan Dahlkvist who is a clothing-line owner / fashion designer. “The one with all the strange colors, Abba on steroids,” Patti says. Patti and David are skeptical that Stefan is really straight. Courtney enters the office and…. she looks different. I can’t put my finger on it, but her face looks different. Maybe she had work done? Maybe she gained a little bit of weight? Not sure… but she just looks different. Anyone else notice this? Courtney admits she’s hard on guys. She doesn’t want a man she can walk all over. Patti tells her that she needs to let the man be the man. Patti and David meet Stefan at his store Moods of Norway. He’s from Sweden, went to college in California, and built the company in Norway. Stefan really loves pink, but he promises he’s straight. His celebrity crush is Jennifer Lopez. Patti tells him he’s a peacock on the outside and a falcon on the inside. Recruiting time… looking for a cocky guy with swagger for Courtney and a woman for Stefan that can look beyond the surface. Patti’s over the top critical of everyone that walked in the door. She screams at the assistants “What the f*ck? !” Ugh…. so cranky, Patti!! Mixer starts and Patti tells the millionaires they’re going to meet the daters with blindfolds on. This way they won’t judge people based on their looks. This makes the mixer super awkward. It’s hard to carry on a conversation when you can pick up on nonverbal cues, but the millionaires eventually adapted. So round one of the mixer is over and the two millionaires narrow down their choices and take off their blindfolds. Now they will have a mini mixer with the remaining. Courtney meets Stefan at a country bar to learn some line dancing. Right away they both seem very comfortable with each other and Courtney is laughing and smiling a lot. Then comes…. the pink limo. HOT PINK limo. Wow. Stefan rented a house in the Hollywood hills and hired a chef. He wanted to open the champagne with a saber, but couldn’t get one in time, so he popped the cork with an ipad. This is truly a one of a kind date. He then hired a gospel singer to come in and sing Amazing Grace at the table. At the end they’re putting their feet in the infinity pool and Stefan leans in for a kiss and Courtney gives him her cheek. Ugh! There’s no pleasing her. Posted by amandatalkstv on January 4, 2014 in Millionaire Matchmaker and tagged assistants, Courtney Kerr, Courtney Loves Dallas, Destin, Jennifer Lopez, Millionaire Matchmaker, Most Eligible Dallas, Patti Stanger, Rachel, Stefan Dahlkvist.